Just a quickie from me tonight folks - I'm cream crackered and I need my bed! Just wanted to share my DT card for todays Copic Colour Challenge. The colours this week are C7, W7 and BG96 and they spoke the word 'boy' to me so I pulled out my trusty Edward! I know, I actually made a boy card without needing too. Although that may have something to do with these fabulous new MME papers. Stamps: 'Edward' by TGF, available here from Dies to Die For. Paper: MME 'Quite Contrary - Little Boy Blue', available here from Dies to Die For. Copic Colours: E00, E11, E43, E47, E49, E50, G21, G85, G99, W1, W3, W5, W7, B93, B95, B97. Tools & Embellishments: Buttons and embroidery thread from stash. Right - night night, sleep tight, mind the bed bugs don't bite.....! Love the papers Stacey! and your colouring is fabulous as always! Stacey this is fabulous, I LOVE this image and what a great layout and perfect colors for him!!! Fantastic ard! Fab card as always Stacey! 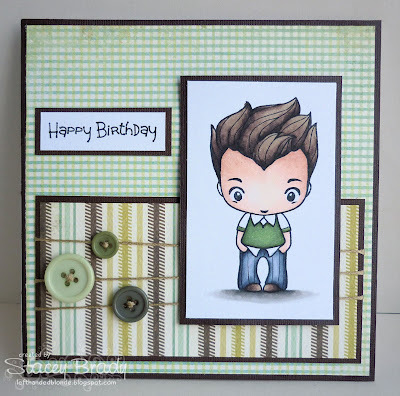 Love this CAS LO, perfect man's card! Oh he is so cute, fab card Stacey. Adorable card, beautiful colouring and love the image! Great card, Stacey. Love it!! Anyhoo, this card is fabulous, such a funky style and layout!